In short: A quiet, comfy luxury cruiser of a sedan. While auto enthusiasts preen over tight handling, raucous exhaust notes and being able to feel the road, many folks find these to be drawbacks in a car. They consider driving to be a nuisance; an aggravating exercise involved in getting from A to B. They want an effortless drive and a plush interior that makes their commute as easy as possible. Lexus sold almost 70,000 of the last generation ES annually to customers who essentially fit this bill. Now comes the new ES 350, a car that should make its target audience even happier. Filled with soft leather surfaces, glossy red-stained wood and some of the best-quality plastics around, the ES 350 coddles its occupants with comfort and convenience. 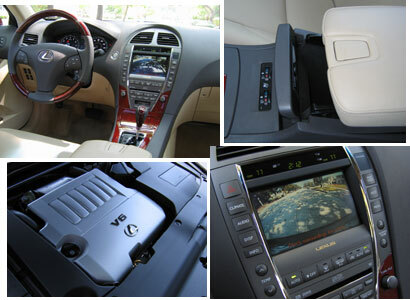 Our fully-loaded tester came with all the toys necessary to make the neighbors go “ooh,” like cooled seats, double sunroof, rear parking camera and a Mark Levinson DVD sound system. These things add up pretty quickly, and the tester shown here had more than $13,000 worth of options on-board putting the ES 350 into the rarified air of the Infiniti M35 and Acura RL. This is luxury territory it can certainly live in; just don’t expect it to keep up in terms of sporty driving. In fact, the ES 350 bestows a feeling of isolation that rivals Outer Mongolia. Every aspect of driving involvement seems to have been purposely sucked out. The thin, wood-rim steering wheel doesn’t have chunky race-inspired grips so common nowadays. The dead pedal—if you can call it that—is gently sloped and carpeted like in an SUV or minivan. The supple leather seats are wide, without any of that silly lateral support that pinches your love handles. The ride is soft, though not floaty, soaking up most road imperfections. The engine is so quiet you might forget it’s running at stop lights. Car nuts might find it hard to believe, but many consumers consider these all good things. This is a car that puts you at ease like soft jazz or a La-Z-Boy—“soothing” comes to mind. The steering isn’t exactly numb; it’s just leisurely and effortless on the forearms. It’s easy to start coasting happily along, tra-la-la, while the rest of the world passes you by. But just when we were getting used to this serenity, we were reminded why we’d take responsive over leisurely any day. 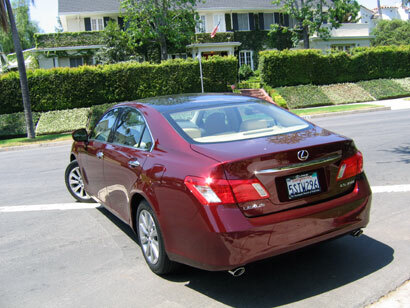 While breezing along Los Angeles’ busy 110 Freeway, an old lady in a Toyota Camry (which is the basis for the ES) decided she’d fancy changing lanes regardless of whether there was a shiny red Lexus next to her or not. After honking, swerving and missing a tiny Datsun roadster, disaster was averted, but the ES 350’s reactions weren’t particularly exemplary. That loose steering was less than confidence-inspiring and it could certainly cause an over correction had the situation been worse. You’d probably get used to it and this certainly isn’t a problem strictly associated with the ES 350 (there are plenty of cars out there far worse), but it shows why having performance-able handling is so important—even if you view cars as a transportation appliance akin to a nice Kenmore. These observations are largely based on personal preferences, so let’s mention some others that all drivers can appreciate—or frown upon. The build quality really is excellent, with every millimeter of the interior made of Grade-A materials. Although they’re pricey, the many tech features are useful and mostly user-friendly. The voice-activated touchscreen navigation system tied to the stereo and Bluetooth telephone is an intuitive device that’s easy to program (although the voice commands take too long). The dual sunroof gives an airy feel to the cabin, but the rear cover is next-to-impossible to open and close from the driver seat. Speaking of sun and glass, the rear window severely reflected our tester’s tan interior, turning the glass nearly opaque when the sun hit it right. A power sun shade prevents the glare, but doesn’t help visibility. There were other nit-picks, like the seat temperature controls hidden at the base of the center arm rest (pictured above) that oddly slides back and up. The large storage bin underneath houses a power outlet and iPod auxiliary input, but there is no hole to sneak a wire out requiring you to jam the bizarre armrest over it. 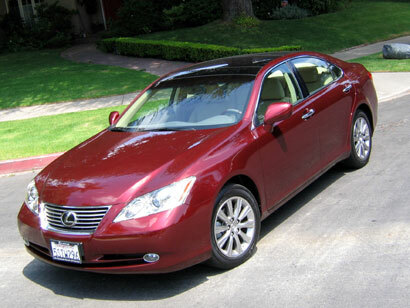 Other than that, though, the interior and the Lexus ES 350 in general should make its comfort-minded drivers very happy. Just don’t expect many driving enthusiasts to be lining up for its keys. Warranty/Service: 4-year/50,000-mile basic warranty; 6-year/70,000-mile powertrain warranty; 24-hour roadside assistance; free first maintenance.